This paper investigates the applications of capture–recapture methods to human populations. Capture–recapture methods are commonly used in estimating the size of wildlife populations but can also be used in epidemiology and social sciences, for estimating prevalence of a particular disease or the size of the homeless population in a certain area. Here we focus on estimating the prevalence of infectious diseases. 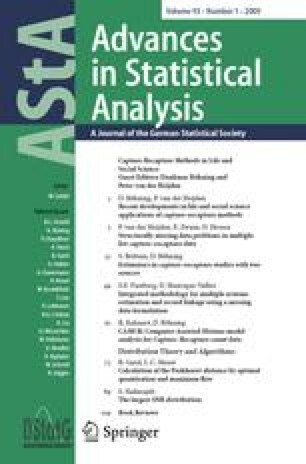 Several estimators of population size are considered: the Lincoln–Petersen estimator and its modified version, the Chapman estimator, Chao’s lower bound estimator, the Zelterman’s estimator, McKendrick’s moment estimator and the maximum likelihood estimator. In order to evaluate these estimators, they are applied to real, three-source, capture-recapture data. By conditioning on each of the sources of three source data, we have been able to compare the estimators with the true value that they are estimating. The Chapman and Chao estimators were compared in terms of their relative bias. A variance formula derived through conditioning is suggested for Chao’s estimator, and normal 95% confidence intervals are calculated for this and the Chapman estimator. We then compare the coverage of the respective confidence intervals. Furthermore, a simulation study is included to compare Chao’s and Chapman’s estimator. Results indicate that Chao’s estimator is less biased than Chapman’s estimator unless both sources are independent. Chao’s estimator has also the smaller mean squared error. Finally, the implications and limitations of the above methods are discussed, with suggestions for further development. We are grateful to the Medical Research Council for supporting this work.